It’s still March but one team appears to be pulling away from the pack. Beyond that we are seeing more parity in OC boys lacrosse than ever before. We are seeing new teams competing to join the upper echelon. Teams rated Nos. 6-12 are actually very close in quality, separated by only about 1.3 rating points. That last point, if it stands up over the course of the next month, could make playoff seeding quite interesting when the committee has to decide which teams have earned seeds 6, 7 and 8 — and home games in Round 1 — and which teams are seeds 9-12 and must go on the road. 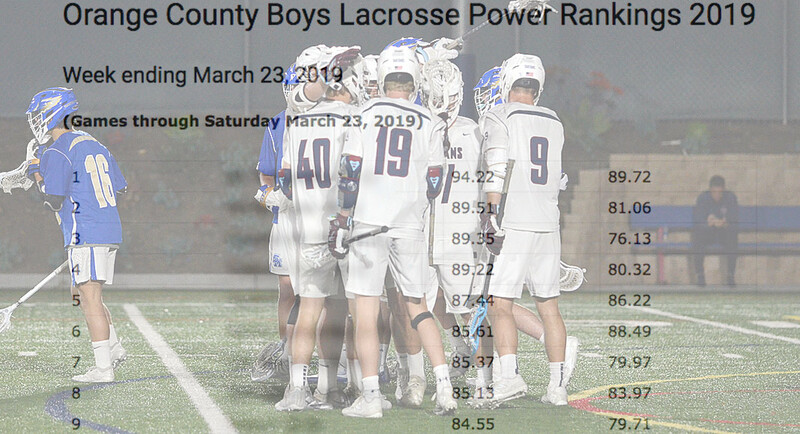 The complete MaxLax OC Boys Lacrosse Power Rankings are available here, with a MaxLax subscription. For an explanation of the MaxLax algorithm, read on: Developed by Michael Traub (Aliso Niguel ’13, MIT ’17), the algorithm processes the final scores of completed games to calculate a rating based on each team’s goal differential in competitive games. The objective is to determine what each game outcome teaches us about a given team, then reflect that in a numerical rating. An expected blowout that actually ends as a blowout is non-competitive and teaches us nothing. An expected blowout that winds up being close, or competitive, teaches us something. For these reasons, the algorithm relies heavily on the concept of competitive games, defined as those in which the score was close or was expected to be close based on each team’s relative power rating. These games reveal a team’s true quality and have much more influence over the ratings than non-competitive games. To hedge against teams receiving credit for running up the score in non-competitive games, the algorithm also evaluates how much a particular game should influence the ratings by calculating a “competitive factor” (CF). Games with a high CF influence the power ratings more than a game with a low CF. Have questions or comments about the new feature? Contact us at [email protected]. Editor’s Note: MaxLax is a community- and subscription-supported website whose mission is to spotlight lacrosse, its teams and its players in Southern California. This post is available to the public, with no subscription required. If you follow lacrosse in SoCal and enjoy our coverage, please consider supporting MaxLax with a subscription. Santa Margarita continues it’s losing streak and moves up in the rankings? That’s where the math says they belong. Four one-goal losses against a strong schedule will do that. Coaches poll might be different when that comes out. Santa Margarita is actually a good example of how the algorithm works. It’s based entirely on goal differentials from game results and can be used for a direct comparison of how the algorithm compares one team to another. The algorithm says that Foothill (87.44) is 1.83 goal Santa Margarita (85.61); Foothill beat SMCHS by a goal. Another example is CdM. SMCHS also lost to CdM by a goal but the algorithm says that CdM is almost four goals better (89.35-85.61). Things get murkier when you look at Los Al v SMCHS. Los Al won by a goal in head to head and has the better record but is ranked slightly behind SMCHS but Los Al’s. I hope that explains how it works. Although there is always room for discussion on the exact ordering, I do think the algorithm reflects what we have seen so far this season, more parity than ever before and a very tight race for the teams in the 2 through about 12 positions. It’s a tourney in the end, who cares week to week if “your team” isn’t ranked where you think it should be.